WARNING - THE FOLLOWING POST IS VERY, VERY LONG. CONSIDER YOURSELF WARNED. The following series is an attempt to make some sense of that most peculiar of subjects: human civilization. My interest lies in the dynamics of civilized societies: their material needs and limitations, the recurring patterns of geography, social organization, and cultural complexity upon which they are built, and the type of interactions that define their relationships with each other and the physical systems they depend on for survival – or in simpler words, the means by which human communities flourish and fall. I present my thoughts on the matter as a collection of notes. While I may rewrite these posts in the form of an essay – or a series of essays – at a later date, the current format is an ideal vehicle for articulating the ideas I have developed. These ideas are not fully developed or organized and will be subject to drastic change as my understanding of civilizational dynamics expands. Underdeveloped as they are, it is my hope that these ideas might be useful to some of my readers. Now men are naturally inclined to judge by comparison and by analogy; yet these are methods which easily lead to error. Should they by any chance be accompanied by inattention and hastiness, they can lead the watcher astray, far from the object of his enquiry. Thus many men, reading or hearing the chronicles of the past, and forgetting the great changes, nay revolutions, in conditions and institutions that have taken place since those times, draw analogies between the events of the past and those that take place around them, judging the past by what they know of the present. My primary historic interest lies with the civilizations of the classical age. The world of Asoka, Shi Huangdi, and Scipio Africanus is a fascinating one, and the modern world would be a better place if our current caste of world leaders studied the lessons of these ancient days. However, the more I study these periods the more I realize that the world we live in is a fundamentally different place than that of our axial forbearers. This fact is little appreciated and (most likely) little understood by most commentators. There are clear limitations to the lessons we can learn from times past. If we do not understand the dynamics by which these societies operated and the ways in which these dynamics differ from those of the modern world, comparisons between the two will do more harm than good. On the broadest terms, the history of humanity can be divided into three periods. The first begins with the evolution of modern humans c. 50,000 years ago and ends with the advent of sedentary society (c. 11,500 years ago - Gobelki Tepe being the marker of this first transition). This was a world without civilization. Complex societies (used interchangeably with “civilization” in this post) have only existed for a fifth of humanity’s existence. While but a small part of human history in toto, it is these last 11,500 years that are the object of our study. Human civilization has gone through two stages. The first of these stages is the longest, beginning with the emergence of complex societies in the Near East c. 11,500 years ago and ending only at the beginning of the 19th century. I submit that every society of this period– from the first chiefdoms to the great empires of Rome and China – operated under the same basic structural constraints. The rules and limitations were the same; the differences were a matter of emphasis and scale. This changes at the turn of the 19th century. Humanity’s third great period begins here (it has not yet ended). The rules by which the modern world operates are incredibly different from those of the old order. The transformation wrought by modernization was no less revolutionary than that wrought by the advent of complex society 11,000 years previous. Population, wealth, and energy production/consumption are three quantitative variables that can be estimated with some accuracy through much of human history. When displayed on a broad scale like this, a striking trend is seen in all three data sets: by 1820 all three begin an exponential climb upwards. This is the “Growth Revolution.” During this revolution human energy production and consumption, population size, wealth, technological capacity, and knowledge all began to increase at an exponential rate. This constant expansion of human resources is the defining feature of our time. Ours is an exponential age. This transition changed the dynamics of civilization dramatically. What were once fights over static material resources became a race to see whose resource base could grow the fastest. This is the defining difference between civilizations modern and ancient – the ways war is waged, wealth is acquired, material needs are met, and societies are organized reflect this distinction. The static civilizations of times past faced limitations and challenges alien to our own. The term “static”, when applied to civilizations or resources, is a relative term. In using it I do not mean to imply that the complex societies of the old order experienced no change or growth. This is not the case. Territorial boundaries shifted this way and that; ancient peoples exhausted natural resources the world over, and economic growth changed the material culture of many a society. However, both the scale and the timing of these changes pale when compared to the changes of the exponential age. To pick an easy example – between the years 1000 and 1500 AD, the per capita GDP of Western Europe (which had the world’s highest economic growth rate) increased by $327 [Maddison 70]. In contrast, between the years of 2007 and 2008 the per capita GDP of the United States grew by $2,380. 500 years of growth on the part of the wealthiest static societies of the old order is equal to less than 7% of a single year’s growth on the part of their modern equivalent! Many of the terms and ideas used to discuss and analyze modern civilization simply do not make sense when applied to static societies. This should not be surprising. Sociology, macroeconomics, and political science are for the most part products of the exponential age. When discussing premodern societies it is difficult – though not entirely impossible – to glean meaningful conclusions with their use. Example: One of the basic building blocks of modern macroeconomics is Gross Domestic Product – or specifically, the percentage by which a GDP grows or shrinks in a given period of time. Such a measurement has no place in the premodern world: not only were changes in growth so tortuously slow as to make measurements useful only when applied over decades and centuries, the idea of GDP itself is superfluous in societies where the vast majority of populace lived isolated at the subsistence level. As classicist Chester G. Starr notes in The Roman Empire 27 BC-AD 476: A Study in Survival even if it was possible for Roman thinkers or officials to calculate GDP, they would have had no use for or interest in it [Starr 24]. That the ancients did not have the precise measurements used today to signify national wealth does not mean they had no way to measure this. The wealth of Solomon’s Israel was given in the weight of the gold and the number of cedars sent to Jerusalem on the annum. The Zuo Zhuan ranks Chu, Jin, Qi, and Qin by the number of chariots they could put to the field. The Han recorded all of the lands and peoples that paid homage to Luoyang. This pattern held into the early modern era: for Olivares and his contemporaries, the wealth of the Spanish Empire was seen best in the treasure fleets sailing between Veracruz and Cadiz. These measuring sticks reflect the societies that produced them. While entire countries could be described as plentiful and wealthy (“land of milk and honey”), few thought to include the entire product of these lands into their measurements. Cedar houses and chariot teams were possessions restricted to the upper echelons of kingdoms, far removed from the great majority of the peoples they ruled. Indeed, as the recurring references to tribute betray, the old elite’s conception of wealth was that which they were able to squeeze from those under their dominion. Even the mercantilists, by far the most sophisticated economists of the old order, built their theories on the assumption that the resource base was static and that the easiest route to economic prosperity was to capture the trade and colonies of others. I propose that these ideas were not simply ideological constructions. It is said that ideas can change the world. Fewer say the obvious corollary: the world can change ideas. Few better examples this truth can be found than the economic ideas of the static age. To understand why I say this, it is best to back up a bit. Wealth is a relative concept whose definition differs not just with time, but with place and context. A better starting point is something universal: energy. Humans can accomplish nothing without expending energy. Breathing, sleeping, eating, physical labor, thinking – it all comes at a specific energy cost. Humans have a rather impressive metabolic scope when compared to other mammals: the maximum aerobic power – power generated through oxidative respiration, sustainable at such rates for about 90 minutes – of most mildly active people is 600-900 Watts; for endurance athletes it is 2kW [Smil 135]. This is the limit of a human being’s physical energy expenditure. Consequently, it is also the limit of human action. Living human beings are not the only things with an energy cost. The things we wear, eat, use for decoration, dwelling and worship, to entertain and protect ourselves, or to kill and maim other humans all have an energy cost. The stone tools of the Cro Magnon were created only through the energy expenditure of the cave men themselves. find a way to control a non-human energy source. Complex societies allow man to do all three. While limited forms of division of labor exist in primitive (= not complex) hunter-gatherer tribes (most notably gender divisions in H-G tribes and the bartering networks that existed between various groups), the energy gains these give are minuscule compared to those of large scale social organization. Hunter-gatherer bands are essentially a small collection of simple heterotrophs that occasionally work together to maximize energy use; civilizations are complex systems designed to increase and exploit available energy flows. NOTE: This in turn enables the 2nd and 3rd options listed. It is only with the advent of complex societies that coercion and plunder becomes a viable shortcut for the expenditure of one’s energy, while the taming of animals and domestication of plants (i.e. harnessing non-human energy sources) likewise comes at an energy cost only an entire community could pay. Complexity can thus be seen as a tool humans use to exploit larger and larger amounts of energy – and consequently, to create higher and higher levels of wealth. 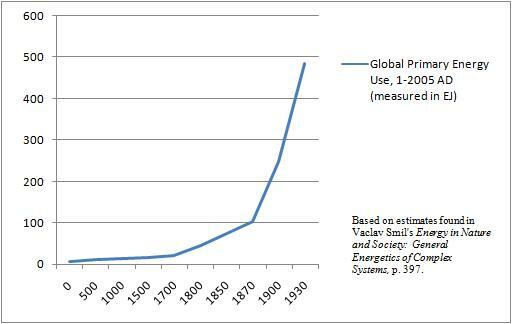 There is only one problem with this theory: in the premodern world increases in complexity are correlated with only marginal increases in the production of energy or wealth. The average Roman peasant, for example, was no better off than the average tribal farmer living in Europe’s “barbarian” regions, despite the clear gap between societal complexity of Rome and the semi-nomadic barbarian tribes. Archeological evidence suggests that the living standards of the barbarians were better than that of the Romans: comparisons of European skeletons dated to the first millennium not only show that men living in Northern Europe were taller and stronger than the men living in Italy and the Mediterranean, but that mean height dramatically increased across Europe in the 5th and 6th centuries after the Empire fell! [Kopke and Baten 24]. Double a very small number and you still have a small number. To think of this in energetic terms: even if all manner of inventions and social arrangements double the amount of energy a man can produce when working at maximum power, he still will not exceed 4kW – not even half of what is needed to power a single cycle in a household clothes dryer. Production comes at a cost. The use of domesticated animals as an alternative energy source highlights this problem, with horses being the prime example. Horses and oxen were incredible labor savers for the premodern farmer. However, it was necessary for these farmers to devote somewhere between 7 and 20% of all farmland to growing feed for working animals [Smil 159]. The Energy Return on Investment for animal labor was extremely low. As long as men and animals were the primary source of energy, the gains of complexity could only be limited in nature. Complexity begets hierarchy. This is a bug in the human system. Human beings cannot navigate complex social relationships without leaders and mediators. Thus every layer of complexity brought with it a layer of hierarchy. With a clear hierarchy in place, the small gains in energy (and more importantly, it’s by-product, wealth) were captured by the few hierarchs stewarding society. This explains the relative poverty of the civilized peasant: in static societies, there is not enough wealth to trickle down. 1. Society is stratified. So stratified that modern man can have trouble grasping the inequality of the premodern world. The Roman Empire provides a clear example on this point. The senatorial class of the Roman Empire was but 2/1000ths of a percent of the empire’s total population; the equestrian class was another 1/10th of 1 percent [Starr 64]. All political, financial, and military power of the empire was held by this aristocracy. All large land owners, imperial bureaucrats and governors, major merchants, and (before the 3rd century) legionary commanders were members of it. All told, the aristocracy’s annual income was about 25% of the empire’s total GDP – an extraordinary amount, considering that the great majority of this product consisted of immobile and/or highly perishable goods produced by farmers scraping away at the subsistence level. The exploitative nature of the Roman regime is perhaps seen best in peninsular Italy. Here per capita income was highest (double that of the rest of the empire). Here also, the percentage of the population living as slaves was highest, being a third of the population (!) and providing half of its labor input [Maddison 48-50]. The Roman aristocracy was a culturally cohesive bloc, and the main patrons of the Greco-Roman culture we associate with the Empire today. Thus an equestrian living in Alexandria had much more in common with other equestrians living in Valentia or Corinth than he did with the peasants farming in the Nile Delta, whose language he did not understand and whose Gods he did not share [Starr 93]. This general pattern – extreme stratification, with an exorbitantly wealthy and culturally cohesive aristocracy ruling over poor, localized, farmers orders of magnitude more numerous than themselves – can be found in all premodern complex societies. (The exceptions to this rule are nomadic peoples. They will be considered shortly.) We tend to think of this type of society as typical of the middle ages. In truth, this was humanity’s default condition long before and after feudalism reached its zenith. The Han Empire, contemporary of the Romans, had a strikingly similar social profile, down to the aristocratic families at once engaged in bureaucratic climbing, landlordism, large scale commerce, and the upholding of the imperial cultural ethos [Lewis, “Early Chinese Empires” 4]. The early modern world was similarly stratified. The nobility of Tokugawa Japan supported itself with fiscal levies equivalent to 25% of the Japanese GDP [Maddison 159]; the income of the Qing and Mughal gentry was at least 15% [Ibid 131; 159]. During the 1500s the entire Portuguese overseas empire was maintained with 10,000 men [Russelwood 60] – a number, I am sure, that was not too much smaller than the local elites the Portuguese missionaries, merchantmen, soldiers, and governors replaced. The consequences of such stratification are worth consideration. Differences in nutrition quality meant that there was a likely marked physical difference between the elite and the masses. The mental gap was no smaller; literacy and learning were largely restricted to society’s upper margins. In practical terms, this means that all literature, art, and philosophy were created for elites by their fellow elites. Politics was an aristocrat’s game, fought between factions of the ruling clique - the masses were extorted by the various sides in play, but only rarely were players themselves. This itself worth a moment’s pause: every thinker from Plato to Hobbes crafted his political theorems with the assumption that the masses were inconsequential members of the body politic. 2. Static societies had two ways in which to become rich: Conquest and population growth. I previously mentioned that humans have three ways of exceeding their energetic output: they can recruit another human, steal from another human, or harness a non-human energy source. The same applies to human societies, save on a much broader scale. Of the three, it is only the last that posed a significant challenge to static societies, as the possible gains the technology of the time allowed were incremental in nature. The list of empires and kingdoms that have grown rich off of the fruits of conquest is too long to repeat here. A few examples will suffice. Well known is Pompey’s claim to have raised the provincial revenues of the Roman state by 70% with his conquest of Syria and Pontus. Caesar made similar claims concerning the conquest of Gaul [Maddison 24]. The wealth of such conquests came in two forms. The first was the plunder looted from the elites of other societies. It was with this wealth Pompey and Caesar held their triumphs. On the longer term, capturing the resource base of other societies’ could fill the coffers of the state. The gold and silver mines of the Americas are the most obvious cases of this sort, but they are atypical (and their impact was on the imperial economies limited [Ibid 92]). 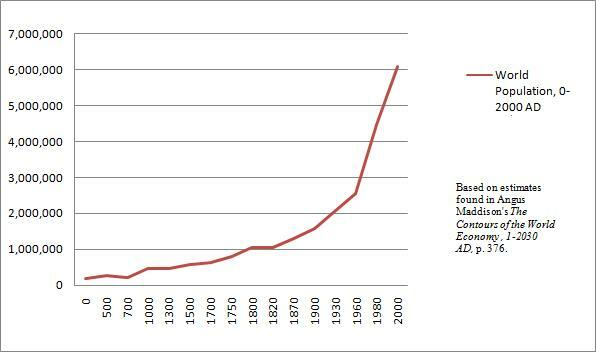 More important to most civilizations was the increase in human capital. Few slaves that labored under Roman masters were born in Roman homes. Qin did not begin its onslaught against the other warring states until it had captured the peoples and farmland of Ba and Shu peoples to the south [Lewis, “Political History” 49]. The greatest source of revenue for the expanding Ottoman state was the taxes it collected from newly conquered non-Muslims [Finkel 73]; it is no surprise that much of the administrative man power of the Ottoman empire came from the devshirme - children who were taken from conquered regions by force, converted to Islam, and trained as scribes, soldiers, and bureaucrats. Population change is the other major way static societies experienced economic growth. This was a truth seen by contemporary observers – Ibn Khaldun, for example, devotes several chapters of the Muqaddimah to the way in which population increased “civilization” and wealth [trans. Rosenthal, vol II, 271]. With a few exceptions (the most notable being Qin’s incessant promotion of emigration from other states in order to civilize the Qin hinterland [Shang Yang 174-82]), this population growth rarely was the result of deliberate policy choices on the part premodern statesmen. Nor was it a quick process – population grew on the scale best measured in centuries. Economic historian Angus Maddison estimates that the population of the Roman Empire doubled between 300 BC and 160 AD; not coincidentally, the aggregate wealth of the empire also doubled in this time. 164 AD is the date he gives to mark the peak of Rome’s population. Not surprisingly, the Roman Empire’s economy began its decline the same decade [Maddison 57-58]. Up until the growth revolution, the richest societies on Earth were the most densely populated. 3. Increases in aggregate wealth were rarely correlated with increases in per capita wealth. While population increases brought more wealth to society, the number of people among whom the wealth was distributed was likewise larger. 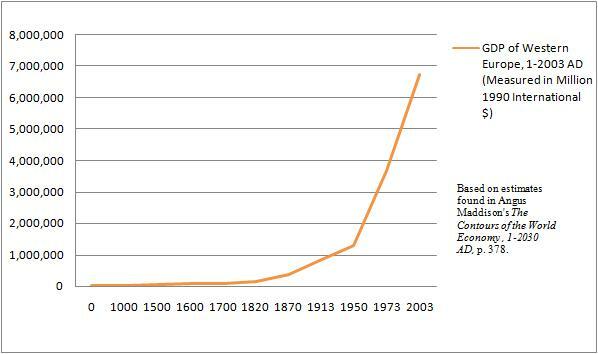 Says Maddison, “From the year 1000 to 1820 growth was predominatly extensive. Most of the GDP increase went to accommodate a four-fold increase in population. The advance in per capita income was a slow crawl – the world average increased only by half over a period of eight centuries” [ibid 69]. Conquest did not usually bring about meaningful increases in the conquering society’s standard of living. Much of this stems simply from the high cost of premodern wars. The cost of maintaining armed forces was approx. 60% of a static civilization’s state expenditure. For example, the percentage spent on the military (during peace time) in preindustrial U.S., Great Britain, Ottoman Empire, was respectively 62%, 67%, and 70% [Starr 88]. Revenue had a way of being eaten up by a static societies’ military apparatus: The Spanish economy saw no benefit from New World silver mines because the proceeds were spent on the Army of Flanders [Maddison 92]. “Barbarians” – complex nomadic and semi-nomadic communities capable of posing a significant threat to those living within the pale of sedentary civilization – are a phenomena unique to the static age. Their dynamics are thus worth consideration here. Historian Peter Heather recently published a gargantuan account of late antiquity’s barbarian polities, Empires and Barbarians: The Fall of Rome and the Birth of Europe. While I have yet to read the book itself, several reviews (see here and here and here) have sketched out the book’s contents. How did barbarians scraping away at the subsistence level manage to get the excess wealth needed to create militaries capable of toppling empires? Heather offers one answer to this question in his book. Between the first century and the fourth century AD the Germanic peoples living on Rome’s frontier transformed from small tribal groupings to large, cohesive, socially complex polities. Heather believes that the catalyst for this change was Rome itself. The Romans, seeking to keep their frontier secure, sought out tribal leaders that could keep local Barbarian populations under control. Once found, they would pay these leaders hefty sums to engender their loyalty. Such favoritism increased both the wealth and prestige of these chieftains to the point where they were handing out their own payments to attract other leaders to their cause. From these patronage networks arose the first complex political structures among the Germanic peoples. The payments also put pressure on barbarian war bands to increase their size and armaments, as the more powerful a barbarian group was, the more likely it would receive the favor of the Empire. Thus competing groups spiraled larger and larger over the centuries until they were of a size capable of threatening the Empire itself. The parallels that can be found between the rise of complex barbarian polities in Europe and complex nomadic polities in Central Asia are intriguing. A decade before Heather wrote Empires and Barbarians Sinologists had sketched out a very similar dynamic between the classical Chinese empires and their nomadic neighbors to the North. Mark Edward Lewis summarizes the leading theory (first proposed by Thomas Barfield in The Perilous Frontier: Nomadic Empires and China 221 BC to AD 1757) in The Early Chinese Empires: Qin and Han. The broad outlines are similar to the Roman case. The survival of nomadic tribes dependent on a steady stream of essential nonfoodstuffs (metal and silk are two clear examples) from the Chinese. Such payments began as bribes and trades (primarily for horses), but was eventually institutionalized in the form of tribute payments. The elite gained power through distributing these goods, and the power of nomadic elites grew with the flow of wealth from China to the steppes. When the flow was cut off, nomadic elites began to militarize their societies so that they would be capable of raiding across the Chinese frontier. If the Chinese would not give these nomadic polities what they wanted in way of tribute, they would take it by force [Lewis, "Early Chinese Empires" 130-131]. Barbarians can thus be seen as the ultimate human parasites. Just as the elites of sedentary society siphoned away the wealth of the masses, barbarian peoples siphoned away the wealth of civilization as a whole. Sedentary elites stole from sedentary peoples; barbarian elites stole from sedentary elites. This also suggests an explanation for the migration patterns of barbarian societies. Heather estimates that no more than 20% of the Germanic peoples living north of the Rhine invaded the Roman Empire – that 20% was the barbarian upper class. The great majority of these semi-nomadic tribesmen were simply too poor and unhealthy to make the thousand mile treks of their brethren. The motivation of these settling conquers – be they Goths, Vandals, Mongols, or Manchus - is easy to see. While the welfare of the average Germanic peasant was better than that of his Roman counterpart [see Kopke, cited above], the lifestyle of the Germanic elite could not compare to that of Rome’s equestrians. Overthrowing empires drastically increased the amount of energy and wealth the leaders of barbarian hoard could hope to skim off the top. Many of the world’s fallen civilizations met their doom by trying to exceed the inherit limits of static civilization. These limits were of two types. The first is a danger faced by any reliant upon a static resource base - declining return on investments in energy and wealth. A negative return on investment is pleasant for no man. For the static society it was often deadly. Premodern societies invested wealth in their conquests with the hope that these conquests would, as did those of Pompey and Caesar, provide a much larger return. When such returns failed to materialize the original resource base used to launch the conquest would not only have to provide for the luxury of the elites and defense of the realm, but also bare the cost of the conquest and preserving territorial gains made because of it. The classic example on this point is Rome’s acquisition (and perhaps more importantly, intense fortification in the 3rd century) of Brittania, which brought the empire little in way of population or wealth, but cost a considerable amount to defend [Starr 19]. The second constraint has already been touched on here – the Malthusian trap in which ancient societies lived. Population growth could not go on indefinitely; when the population decreased, so too did the wealth available to the ruling elites. The societies that ran befoul of these constraints had few options available to them. Such societies are characterized with an ever increasing attempts to do more with less - successful in some instances, but disasters in the others. Both the Ottoman and Roman Empires can testify to the chaos caused by a contracting resource base. Struggling to find wealth they did not have, both began debasing their coinage – denarii on part of the Romans and aspers on part of the Ottomans. Both debasements (in the Roman case, a decline in the silver content from 97% to 4%!) ushered in a century of rebellious armies fighting against their empires [Maddison 30; Finkel 177]. Such civil strife weakened both empires to the point where neither could withstand the external threats that faced them the following century. Finkel, Caroline. Osman’s Dream: The History of the Ottoman Empire. (New York: Basic Books). 2005. Ibn Khaldun. The Muqaddimah: An Introduction to History. Translated by Franz Rosenthal. 3 volumes. (Princeton: Princeton University Press). 1958. Lewis, Mark Edward. The Early Chinese Empires: Qin and Han. (Cambridge, Massachusetts: Belknap Press/Harvard University Press). 2007. Lewis, Mark Edward. “Warring States Political History.” Cambridge History of China. Volume 1, The Ch'in and Han Empires, 221 BC–AD 220. Edited by Denis Twitchett and Michael Loewe. (Cambridge: Cambridge University Press). 1987. Koepke, Nikola and Joerg Baten. “The Biological Standard of Living in Europe During the Last Two Millennia”. European Review of Economic History. Volume 9. pp. 61-95. Kohl, Lawrence Frederick. Politics of Individualism: Politics and the American Character in Jacksonion America. (Oxford: Oxford University Press). 1989. Maddison, Angus. Contours of the World Economy: 1-2030 AD: Essays in Macroeconomic History. (Oxford: Oxford University Press). 2007. Russel-Wood. AJR, The Portuguese Empire, 1415-1808. (Baltimore: John Hopkins University Press.) 1998. Shang Yang. The Book of Lord Shang. Translated with introduction by J.J.L. Duyvendak. (London: Arthur Probsthain). 1928. Smil, Vaclav. Energy in Nature and Society: The General Energetics of Complex Systems. (Cambridge, Massachusetts: MIT Press). 2008. Starr, Chester G. The Roman Empire, 27 BC-AD 476: A Study in Survival. (Oxford: Oxford University Press). 1982. Nicely done! Is part two available yet? I stumbled upon your blog while searching for the numbers of global energy production. I am most impressed. Your comments are deep and insightful. Keep up the excellent work. The population of the planet is growing exponentially. Consequently, there is overpopulation of countries such as China, and worst of all, the resources of the earth are running out. I covered this topic in detail in my quality essay for my university. If Elon Musk does not make Mars available for living, our planet is finished.